Crowe made his first sketch of gypsies at Shenfield Common in Essex in May 1873. He rediscovered the sketch more than 20 years later, and made a new painting of the foreground at the same site on 23 July 1896. The picture was exhibited at the Walker Art Gallery in Liverpool in the autumn of 1897. The picture, then called The Gipsy Encampment, was one of those remaining in Eyre Crowe’s possession at his death, and was sold for £2 12 6 at an auction of his remaining works at Christie’s in London on 18 March 1911. A painted sketch for the painting (presumably either the original from 1873 or one executed in 1896), entitled ‘Horses in A Field With Gipsies And A Caravan’ was given to the Fitzwilliam Museum in Cambridge by Michael C. Jaye in 2004 (PD.37-2004). Size: 17 x 29 cm. Details of this sketch and an image are available on the museum’s online catalogue. 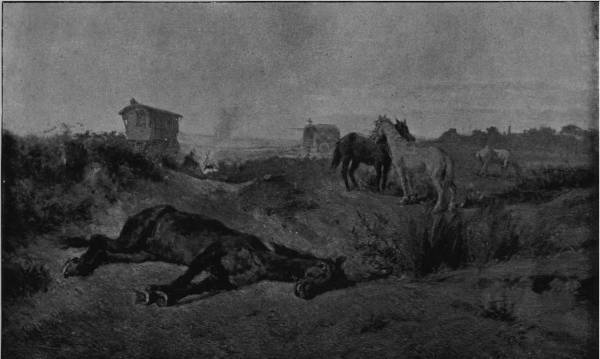 The Gipsy’s Rest (815), a smaller picture by Mr. Crowe, has the advantage of a pitiful subject, a half-starved, worn-out horse, which, released from the shafts of the van in the distance, has lain down upon a common, and seems to be breathing his last alone. A little in the rear two other horses – fellow slaves with their dying companion – stand apart, so close together that they seem to be whispering about his fate. Two vans and a group of gipsies cooking their food and heedless of the horses complete the picture… The rough surfaces and somewhat opaque colour of these pictures are unfortunate, and tell greatly against them.